The land for the church and churchyard was given by Charles Sotheby, Lord of the Manor, who “released” the land - about one acre - in 1869 from the forest. The church building was paid for by Thomas Charles Baring MP, a director of Baring Brothers’ Bank, who had recently moved into nearby Wallsgrove House. He chose the architect and style. The current church building was designed by A W Blomfield (later Sir Arthur) in the Early English Gothic style with a broach spire, inspired by 13th century stone churches of the East Midlands, and it was completed in 1873, at a cost of £5,500. The spire is 125 feet high. The weathervane bears the Latin words “LAUS DEO” – ‘Praise the Lord’. At the corners of the tower are four gargoyles – water spouts carved in the shape of fierce winged creatures. In the tower are thirteen hemispherical bells, cast in 1873 at the Whitechapel Foundry. The largest bell is 2’8 ½” diameter and weighs 4 ¼ cwt. The total weight of the bells is nearly 2 ¼ tons. They were originally played by a weight driven device with pinned barrels but are now operated from a key-board with manual levers. The timber roof of the nave is a copy of the hammer-beam type found in medieval churches. The main roof was repaired with wood from orange-crates after the Second World War. There are several tablets on the walls, including war memorials for both world wars, some brass memorials and one in memory of the longest serving incumbent, Josiah Norton. Victoria stained glass remains in the windows in the north transept. Similar windows in the chancel and south transept were shattered by a German rocket which exploded nearby in 1945, also damaging the church roof. The chancel windows were replaced with modern stained glass given in 1949 in memory of his wife by Mr F F McKenzie, Superintendent of the Forest for thirty-nine years. On the left is St Francis and on the right, St Stephen and the Holy Innocents. The contents of the north transept were originally in the south transept which was furnished as a chapel in 1960 in memory of Colonel E N Buxton and Mrs Buxton. He was an Epping Forest Verderer. The altar frontal is embroidered with the cattle marks of the local forest parishes, and the kneelers have forest designs. A guide to the brand marks stands on the altar. 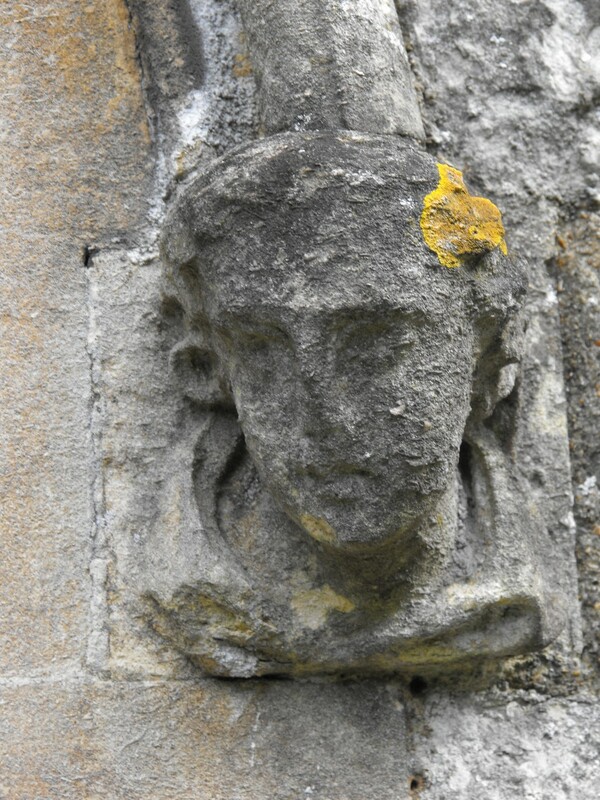 There are four carved stone heads inside the church and thirty-four others outside. The Lych Gate was erected in 1898 in memory of Mr and Mrs Arrowsmith of nearby Arabin House by their son, Mr Walter Arrowsmith. In the churchyard near the main road, is a tall stone carved with runic script (Old Scandinavian). It has a quotation in Anglo-Saxon from Beowulf: “Then at the fated hour Scefing, very brave, passed hence into the Lord’s protection.” It is a clergyman’s memorial with the names of his wife and son on a flat stone nearby.